ESO Supernova Exhibition — What are black holes? 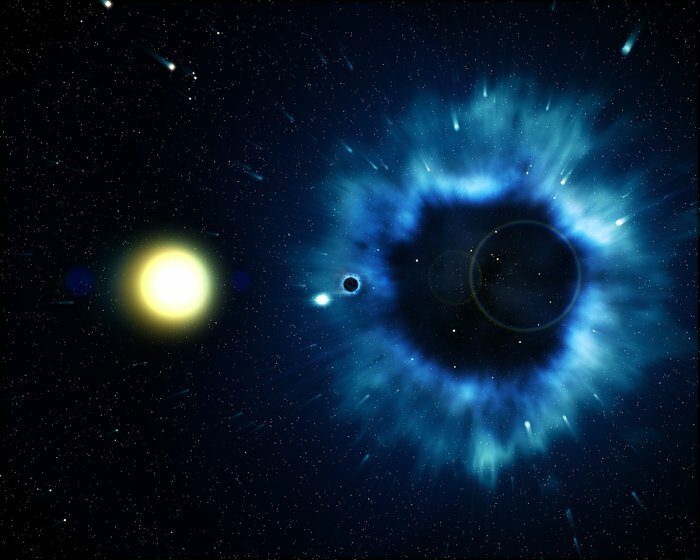 When a massive star dies, its core collapses into a superdense, rapidly spinning neutron star, or even into a black hole – a mysterious object from which not even light can escape. Pinball black hole: The black hole remnant of a stellar explosion is no longer in the centre of the expanding supernova remnant, but is kicked into space, together with its companion star (artist impression). Distorted view: Up close, you would see a black hole’s shadow silhouetted against the background, while its strong gravity bends light in peculiar ways (artist‘s impression). What’s left after a massive star goes supernova depends on the mass of its core. If it’s between 1.4 and about 3 solar masses, the strength of nuclear particles balances the force of gravity. The resulting neutron star is less than 30 kilometres across and has the highest density known in the Universe. If the core is more massive, even neutrons are crushed out of existence. The result is a black hole – a mysterious object with a gravitational field strong enough to trap even light. Down the drain: Matter from its companion star piles up in a hot accretion disc before spiralling into the one-way abyss of a stellar black hole (artist‘s impression). Condensed matter: A neutron star is more massive than the Sun but not much larger than the city of Munich. 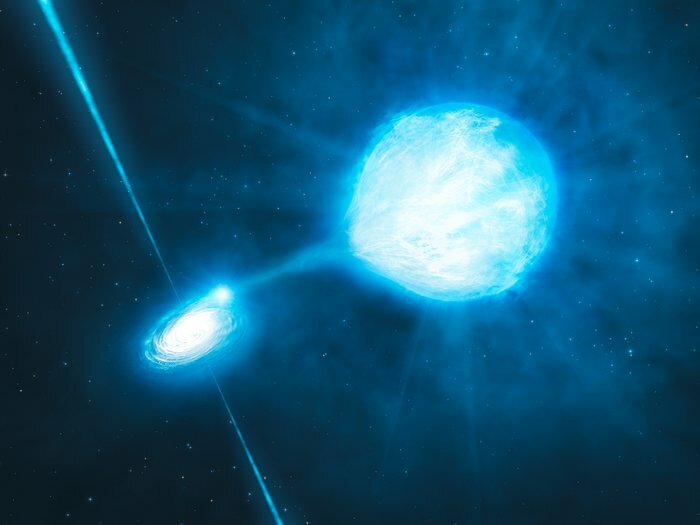 One teaspoon of neutron star matter weighs as much as the whole human population. Don’t get too close to a black hole! If you fall in you can’t get out again, even with the fastest rocket. Not even light can escape! That’s why it’s pitch black.